Shipbuilding and conversion based on quality technical solutions. Meeting deadlines is our highest priority. Ship building and conversion within the established timeframe. More than 25 years in the sector with the best shipbuilding specialists. Custom shipbuilding using the best materials and the most cutting-edge systems and equipment on the market. We are international company that provides technical services. Our activity is focused on providing technical assistance to cruise ships around the world via riding squads, steel shipbuilding, and repairing and maintaining vessels in dry dock and wet dock. 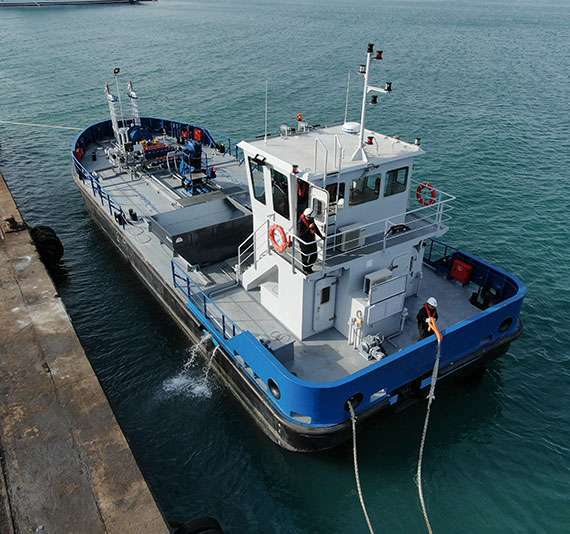 We have our own facilities and shipyard in Barcelona, as well as workshops in the Dominican Republic in order to provide our services in the Caribbean. This section includes information regarding the general terms of access and use of the www.sym-naval.com, which the user must be aware of, for the purposes specified by Spanish Law 34/2002, dated July 11th, regarding Information Society Services and Electronic Commerce. Registered on the Register of Companies of Barcelona in Volume 4.246, Folio 62, registration sheet number B-409.147. Access to the services offered through the website www.sym-naval.com is free and generally does not require users to have previously registered or subscribed. If the user does not agree with the content of these general terms of browsing, they must leave the website and cannot access it or use the services offered. The user guarantees they are over 14 years old. They also guarantee the veracity and authenticity of any information that is communicated and also agree to keep this information up-to-date. At any time that SYM deems appropriate, it may modify the configuration of this website, the terms of service and its content, in addition to eliminating, limiting and temporarily or permanently limiting or suspending it, or preventing access to it, whilst always trying to inform the user of this change through a publication on the website, where circumstances permit. The user agrees to make appropriate use of the services and/or contents of the website and to not use them for illicit activities or any possible criminal actions and/or actions that violate the provisions of this Legal Notice, in the regulation on intellectual or industrial property, or any other legal provision. The use of the information contained on this website is the sole responsibility of the user. The user guarantees the authenticity and veracity of all the data communicated to SYM, through the different online forms, and is responsible for the inaccuracy or lack of veracity of the information provided. Content of a racist, xenophobic or pornographic nature, in defence of terrorism or which violates human rights. Content that promotes actions that are criminal, denigrating, defamatory, violent or, in general, contrary to law, morals, good customs and public order. Information or content that violates fundamental rights and public freedoms recognised both constitutionally and in international treaties. Information or content that constitutes an infringement of the intellectual or industrial property rights (including but not limited to patents, trademarks and copyright) of SYM or of third parties. Unauthorised or unsolicited advertising, spam, chain emails, pyramid schemes, etc. Data programmes (virus and malware) that are likely to cause damage to the computer systems of the service provider, its suppliers or third-party internet users. SYM cannot control the way the www.sym-naval.com website and its contents are used by users, and for this reason it is not responsible for damages of any kind that may arise from an illegal, incorrect, inadequate or partial use, or from the user’s breach of these terms of access and use, as well as any other term that may be found on this website with respect to any of its services, without prejudice, in any case, to the legal actions that SYM or third parties may be entitled to. SYM cannot guarantee the permanent availability and continuity of the website’s functioning, or of the information, content, software, materials or products it includes. Thus, it cannot be held liable for damages of any kind that may arise from the lack of availability or continuity of the website’s functioning, its services or the use made by users of the website. In any case, SYM will make every effort to maintain the continued availability of this website. Likewise, SYM is not responsible for possible errors or security deficiencies that may arise from the user’s use of a browser in an outdated or unsafe version, or from the activation of devices for storing keys or identification codes belonging to the user who is registered on the browser, or from damage, errors or inaccuracies that may arise from misuse or malfunctions. For this reason, the user exonerates SYM from any responsibility in relation to the reliability, usefulness or false expectations that the website may cause during browsing. In the event that the user causes any type of damage or injury to third parties, this user is solely responsible. The user will also be responsible for the expenses, costs and, where applicable, compensation that may arise from any legal proceedings for the breach of the provisions of these terms and the applicable regulations. All the contents of this website (including but not limited to databases, images, drawings, graphics, text files, maps, frames, banners, software and its various source, audio and video codes), as well as the website itself as a visual presentation, are owned by SYM, or its content providers, which have been licensed or assigned by them, and are protected by national and international regulations on intellectual and industrial property. The compilation (understood as such to be the collection, arrangement and assembly) of all the content of the website is the exclusive property of SYM. All the software used in the use and development of the website is owned by SYM, or its software providers, and is protected by national and international industrial and intellectual property laws. Any form of public communication, by any means, including making it available to the public so that anyone can access it from the place and at the time they choose. Any form of distribution, including but not limited to a sale, rental or loan. Any form of direct or indirect, temporary or permanent reproduction, by any means and in any form, of part or all of the website or its contents. Any form of total or partial transformation, including the creation of derived products and services. Any other methods of access that include the previously-mentioned or different methods. Any direct or indirect form of extraction and reuse of all or a substantial part of the content of any database, and the extraction or repeated or systematic reuse of its non-substantial parts. Notwithstanding the foregoing, the user can freely view the website and its contents and download them for personal and non-commercial use, without being able to extend them to third parties or entities, whether free of charge or otherwise. Accordingly, in no case does the availability and use of the databases, images, drawings, graphics, text, audio and video files and software owned by SYM or its suppliers that are contained on its website, as well as any other content, imply the transfer of ownership or the granting of a right of use in favour of the user. The trademarks, signage, distinctive signs or logos that appear on the website are owned by SYM, or have been licensed or assigned by the owner and are duly registered or in the process of being registered. The unauthorised or improper use of these elements is an infringement of the industrial property rights of SYM or other third-party owners. SYM ensures that the contents of this website do not have a pornographic, xenophobic, discriminatory, racist or defamatory nature, nor do they encourage violence. Likewise, it tries to avoid any circumstance that may be harmful to users. Personal information of the person presenting the claim: name, address, telephone number and email address. Specification of the alleged illicit activity and the precise and concrete indication of the protected contents, as well as their location on the webpages. In the event that there is a violation of rights: personal information of the owner of the allegedly infringed rights, or of the person authorised to represent them and their signature. An express and clear statement, for which the claimant is responsible, that the information provided in the notification is accurate and that the use of the contents or the described activities carried out are of an illicit nature. It is strictly forbidden for the user to make alterations on this website that may affect its contents, such as links and the like. It is also prohibited to establish links to this website from websites or other media that are contrary to law, morality, public order, or that threaten the good name or image of SYM and any of its distinctive signs. The user must know that they are accessing this website and, in addition, the URL must appear on their browser corresponding to the page being linked to. SYM maintains a confidentiality policy for the data provided by its users and is committed to protecting it. This protection extends to everything that refers to the collection and use of information provided through the internet. In this regard, SYM guarantees, in the terms established in the General Data Protection Regulation (hereinafter, GDPR) that it will confidentially use users’ personal data, and that it has adopted the appropriate technical and organisational security measures in its facilities and systems. SYM may release personal data, and any other information recorded in its files through its computer systems, to the competent public authorities when asked to do so in accordance with the applicable legal and regulatory provisions. In compliance with the provisions of Article 13 of the GDPR, whenever a user of the website is asked for personal data that is to be processed, at the very least they will be duly informed of the identity of the data controller (SYM), of the purpose for which the data is obtained, the legal basis, erasure and the rights the data subjects are entitled to, as well as any other requirements of current legislation. SYM will use the user’s data with the purpose for which it is required and will only send information about its products when this has been expressly authorised. The data subject can exercise their rights of access, rectification, erasure, portability, limitation and objection by writing to the email address legal@sym-naval.com, or by postal mail to Paseo Marítimo S/N, Muelle Comercial, 08800 Vilanova i la Geltrú (Barcelona), indicating “GDPR rights” as the reference. If your rights are not enforced, you can appeal to the AEPD (Spanish Data Protection Agency). The general terms of this Legal Notice and any other text of a contractual nature regarding this website is regulated by Spanish legislation. For any dispute arising from the access and use of this website and its contents and services, as well as the interpretation and compliance with these general terms and any other text of a contractual nature regarding this website, the parties expressly waive any other jurisdiction to which they may be entitled and expressly submit themselves to the courts and tribunals of the city of Vilanova i La Geltrú (Barcelona). In accordance with Article 13 of the GDPR, we inform you that the personal data you provide on the form will be processed in order to manage your request or query in the broadest sense. The personal data to be processed will be that which is included in the category of identifying data, such as name, contact number, email, etc. The legal basis for this processing is the correct execution of your request or query. The personal data will be kept until we have finished managing your request, unless you consent to receiving commercial information by expressly accepting the Advertising Policy. The data subject can exercise their rights of access, rectification, erasure, portability, limitation and objection by contacting legal@sym-naval.com, or by writing to Paseo Marítimo S/N, Muelle Comercial, 08800 Vilanova i La Geltrú (Barcelona), referencing “GDPR rights”. If your rights are not enforced, you can appeal to the AEPD (Spanish Data Protection Agency). The company SHIP & YARD TECHNICAL MANAGEMENT, S.L. (hereinafter, SYM), as previously reported, is responsible for processing your personal data and will use this data to manage your request. Notwithstanding the foregoing, if you check off the “Advertising Policy” check-box, you expressly authorise us to use your personal data to contact you by any means, including via the internet, for the purpose of sending you commercial advertising regarding the services offered by SYM. In this type of data processing, consent is the legal basis for the processing, and your data will be kept until you expressly communicate your desire to revoke said consent. The data will not be communicated to third parties. You can exercise your rights of access, rectification, deletion, portability, limitation and objection by writing to the email address legal@sym-naval.com, or by postal mail to Paseo Marítimo S/N, Muelle Comercial, 08800 Vilanova i La Geltrú, (Barcelona), indicating “GDPR rights” as the reference. If your rights are not enforced, you can appeal to the AEPD (Spanish Data Protection Agency). Cookies are files that are downloaded to your computer when you access certain web pages. Amongst other things, cookies allow a web page to store and retrieve information about the browsing habits of a user or their computer. In addition, they improve the browsing process, since they allow the website to offer the user information that may be of interest to them depending on how they use the site. If you would not like to receive cookies, please configure your internet browser to delete them from your computer’s hard drive, block them or notify you if they are installed. To continue without making any changes to your cookies settings, simply continue browsing the website. The cookies we use do not store any personal data or any information that could identify you. a. PHPSESSID: This cookie is used by the PHP encryption language to allow the SESSION variables to be saved on the web server. These cookies are essential for the website to work. b. 1P_JAR: A cookie that transfers data to Google to make the advertising more attractive. c. CONSENT: Stores the acceptance of cookies on websites.